Your brand is an essential part of your business. Your brand identity – everything visual about your brand – is critically important to build loyalty and trust with customers and prospects. A strong brand identity starts with a unique logo and business name, but branding is more than a good logo and name. If your brand identity isn’t successfully communicating what you do and what you stand for, then you’re losing business without even realizing it. That’s where a SWOT analysis can help. A SWOT analysis is a strategic planning framework used to take a big-picture look at the internal and external factors impacting your brand and business. 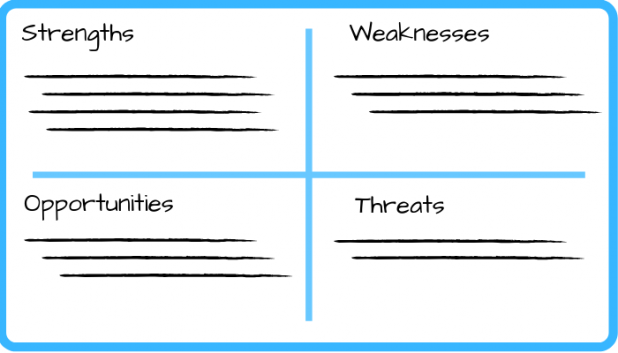 “SWOT” stands for Strengths, Weaknesses, Opportunities, and Threats. Strengths and weaknesses address the internal factors within your business or brand that are working for and against you. Opportunities and threats address the positive and negative external factors your brand must navigate through. A SWOT analysis isn’t appropriate for every business decision you make throughout your day. The in-depth process would get in the way of moving forward quickly. But, if you’re considering large business decisions – like a new partnership, adding a new product line, offering a new service, big adjustments to internal policies, or adding a new position or department – then a SWOT analysis is a good idea. You should also use this technique anytime you find your business stalling, a project fails, when you’re starting a new business, or you have unexpected success. Finally, you should conduct a SWOT analysis anytime you consider making any significant changes to your brand or brand identity. Your brand is made up of both your business’s authentic attributes, what your business chooses to present, and how your business is perceived by your audience. A proper SWOT analysis should involve a cross-section of your team. You want people who have different perspectives on the company and should include your company leaders and founders, as well as people from sales, marketing, product development, engineering, etc. In fact, some companies even invite customers to participate in a SWOT analysis. A SWOT analysis can be done in a matter of hours and should be done regularly (at least once every 6 to 12 months). You simply list all of your business’s strengths and weaknesses along with all of the outside opportunities and threats that may impact your business. But, as with most simple things, a SWOT can be tricky to execute well. Here are some general guidelines for getting the most from the exercise. Be organized. We recommend creating a 2×2 grid with each quadrant labeled with the appropriate heading. Then list the relevant items inside each quadrant. Use bullet points to keep your ideas concise. Don’t rush. For a SWOT to be truly useful, it must be comprehensive. Plan to do some real research into your brand’s assets and liabilities, as well as external threats and opportunities. If you don’t take the time to really look, you may miss important factors. And, it’s discovering these potential unknowns that provides the most value. Be realistic. The goal of any SWOT analysis is to make better choices that are informed by a deeper understanding of your situation. You can only succeed if you’re honest about what your threats and weaknesses are, and what strengths and opportunities you have to combat them. Your SWOT analysis should begin with an earnest look inward at your business and/or brand. Objectively identifying your brand’s strengths and weaknesses allows you to capitalize on those strengths and improve or accept your weaknesses. Once you’ve reviewed your internal challenges and resources, it’s time to cast your gaze outward and create a list of opportunities and threats. The world around you is full of threats and opportunities you may never have considered. This is your chance to get those unknowns on your radar so that your brand can act accordingly. The opportunities and threats you identify can then be prioritized and reviewed through the lens of the strengths and weaknesses you’ve already identified. Below, we’ve shared a list of SWOT questions to help you get started. Does your business have a unique backstory or mission? What strengths or unique skills do your employees possess? Is your business well-funded or does it own other useful resources it can rely on? Does your business have a proprietary product or service that can’t be obtained elsewhere? In what respects is your brand well-perceived? In what ways is your brand aligned with your current mission and business direction? What aspects of your brand are authentic? Which elements of your brand resonate with your target audience? In what areas does your business regularly perform poorly? Does your business lack resources such as time, staff or funds? Are your business goals unfocused? Do you lack strategies for moving forward? Are there elements of your brand that are inauthentic? Is your business failing to follow through on any brand promises? Are any brand messages failing to resonate with your audience? What aspects of your brand are perceived poorly? Can you fill a niche that is currently empty or under-represented? Could you partner with another business to gain exposure, financial support or consumer goodwill? Can your product or service outperform a competitor’s? Will changes in state or federal legislation help your business in any way? Are improving economic trends likely to impact your business? Can your brand authentically align itself with any popular causes? Do any current trends benefit your business or brand? Are there any new technological advances that could improve your product? Can you modify an existing product or service for a new demographic? Is there an existing unsung aspect of your brand that you could highlight? What are your competitors offering that you can’t compete with? Are downward economic trends likely to impact your business? Will changes in state or federal legislation hinder your business in any way? Are any of your vendors or suppliers unreliable, increasing their prices, or going out of business? Are there any cultural shifts that may harm your business or brand? Are there any current events that may cast any elements of your brand in a negative light? Is your brand aligned with any negative entities, organizations or ideologies? Are any competitors attempting to discredit your brand? Once you’ve compiled all of your threats, opportunities, weaknesses, and strengths, it’s time to create an action plan. You’ll have the high-level perspective you need to make the best choices for your brand. Katie Lundin is a Marketing and Branding Specialist at crowdspring, one of the world’s leading marketplaces for crowdsourced logo design, web design, graphic design, product design, and company naming services. She helps entrepreneurs, small businesses and agencies with branding, design, and naming, and regularly writes about entrepreneurship, small business, and design on crowdspring’s award-winning small business blog. The post How SWOT Analysis Can Help You Build a Successful Brand appeared first on SiteProNews.